Beading Arts: Introducing Stringing month! One of the first beading techniques that most people learn is how to string. 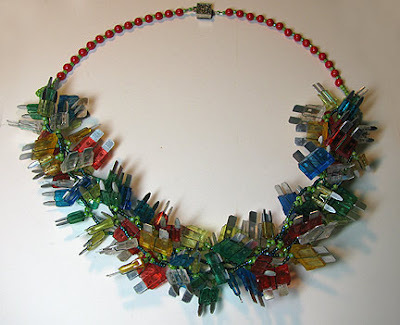 After moving on to bead weaving, bead embroidery, and mixed media techniques, some of us forget about that thrill that we got when we first learned how to string a pleasing necklace or bracelet. We forget how exciting it was to learn how to finish off a piece with a polished-looking closure. Moreover, never forget to revisit basic stringing and figure out ways to make your pieces unique! This month, I've got a number of projects and featured artists for you, plus a fabulous book giveaway (coming on Wednesday! ), all dancing around the issue of how to make your stringing projects unique. Do you have a piece you'd like to share, or have you written up a tutorial for an innovative stringing piece that will help take our work to the next level? If you'd like to share, please drop me a line at cyndi @ mazeltovjewelry.com (remove the spaces).